Texas is close to allowing low-level radioactive waste from dozens of states to be trucked in and disposed at a site in West Texas, which would become one of only four in the nation that could take low-level radioactive waste shipped from out of state. Three other sites currently accept low-level radioactive material: Richland, Wash., since 1965; Barnwell, S.C., since 1971; and Clive, Utah, since 1991. 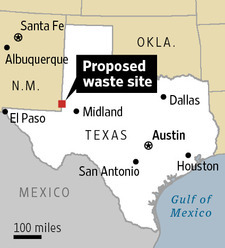 A state agency with oversight of waste imports adopted rules Friday that help clear the way for the 1,338-acre dump near the New Mexico border, despite concerns expressed by environmentalists that such a facility may be unsafe. Its operator, Waste Control Specialists LLC, still needs final approval from the Texas Commission on Environmental Quality, but expects to receive it within several weeks. The company is majority-owned by Texas billionaire Harold Clark Simmons, one of the nation's wealthiest men and a major donor to Republican state and national political candidates. Supporters of the project, located in a remote red-clay formation just east of the New Mexico-Texas state line about 31 miles from the town of Andrews, Texas, maintain it is environmentally safe and note that it will generate needed revenue for Texas. Critics contend that water near the disposal site could become contaminated by the waste, which can include radioactive material from nuclear-power plants, research facilities and hospitals. They also say that truckloads of refuse will be traveling through Texas with insufficient oversight, creating a recipe for trouble if they get into accidents.